MALACCA: The Holy Light Church (English) received a cheque for RM500,000 from the Government for the construction of its building in Jalan Persiaran Ponderosa in Johor Baru. 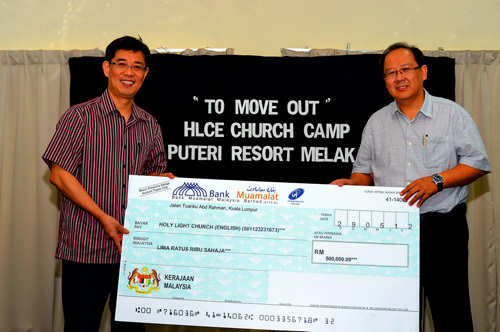 It was good news for church members who were having their annual camp at Puteri Resort here when they received the cheque from congregation member and senior lawyer Roger Tan. Tan said they were grateful that the cheque was received so soon after Deputy Prime Minister Tan Sri Muhyiddin Yassin approved the grant. Tan, who is also a Commissioner in the National Water Services Commission, was at the signing of the Water Services Restructuring Water Agreement on May 23 in Putrajaya when he approached Muhyiddin about the church being in urgent need of funds to complete its RM4mil building. The building, which houses a worship hall, a multi-purpose hall and meeting rooms, is due to be completed in October for the church’s 60th anniversary celebrations. “The generous gift from the Government is indeed a pleasant surprise and yet so timely,” said senior pastor Dr Chuah Seong Peng. The church also received a grant of RM200,000 from the Johor Government in August 2010. Tan hands over a mock cheque to Pastor Dr. Chuah.